Enable you to enjoy wonderful DVD movies on iPad widescreen with iMacsoft DVD to iPad Converter for Mac. This Mac DVD to iPad Converter can allow you to rip DVD to iPad MPEG-4, H.264/MPEG-4 AVC video and iPad MP3, AAC, M4A audio formats on Mac easily. 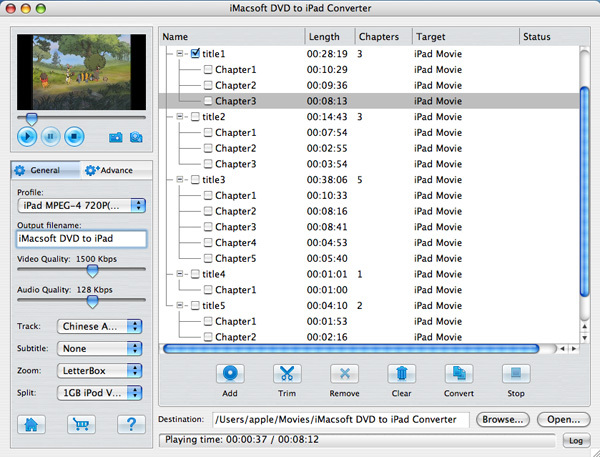 iMacsoft DVD to iPad Converter for Mac presets multiple videos at different resolutions for iPad, such as 1080*720, 720*480, 640*480. To get better playing effect, you can choose subtitle, audio track and aspect for target iPad movie. Choosing movie segment and splitting large file are available in this Mac DVD to iPad converter. All the converted video and audio files from DVD can be played perfectly on iPad, iPad 2, the new iPad, iPad mini, iPad 4, iPod touch, iPod touch 4, iPod nano, iPod nano 5G, iPod nano 6G, iPod classic, iPod shuffle, iPod shuffle 6G, iPhone 3, iPhone 4, iPhone 5, iPhone 5S/5C, iPhone 6/6 Plus, etc. iMacsoft DVD to iPad Converter for Mac is the most magic product beyond your imagination. Free download this useful software and enjoy your favourite DVD movies on iPad anywhere and anytime! How to convert movie DVD to iPad MP4 video files on Mac? How to transfer movie DVD to iPad library on Mac?